the nytpicker: NYT Reports That "The Taliban Could Not Be Reached For Comment." We Didn't Even Know The Taliban Had A Phone Number! 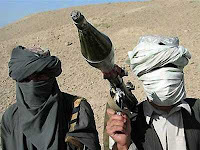 Doesn't anyone have the Taliban as a Facebook friend or Gmail contact? Come on, reporters. Think outside the box a little bit here. Keep reporting from the bedroom of your mums house in Jersey NytWyt - leave the Swat valley and life to Ellick Ok?